Tangent Games - Taking Games In A New Direction! "When your players head off on a tangent, shouldn't you be ready?" The Ados: Land of Strife campaign setting incorporates many new optional rules, concepts, and ideas, from the use of language as a true skill, to using armor to deduct from damage taken in combat. This character sheet is modified for use with the Ados: Land of Strife campaign setting and is for personal use only. Permission is granted for you to make copies to use in your games. Ados: Land of Strife requires the use of the Dungeons & Dragons, 3rd Edition or 3.5 Edition rules to play. The Ados: Land of Strife character sheet is compatible with the 3.5 Edition of the rules. In The Divine Order: Jute - Faith of Creation we present the Jutian Faith in all the detail and glory it deserves. One part of the book deals with the architecture of Jutian churches and we presented a description of the Cathedral of Jute. Several NPCs are listed in that description and we present those NPCs here. Each NPC is detailed on their own page for ease of printing, so feel free to use these NPCs to run adventures located at the Cathedral of Jute, or adapt them to your own campaign. These NPCs are presented under the OGL and are considered Open Gaming Content. New monsters mean new counters! We know how it is, you have a new monster from Brixbrix's Field Guide to the Creatures of Ados that you want to use, but no way to really represent that monster to your players. Have no fear. We have anticipated your needs and made counters for each of the monsters in the Field Guide. The counters are scaled for use on standard grids of 1 inch equal to 5 feet. Monsters are scaled according to their listed size in the Field Guide. Just print them out on a heavy paper or card stock, cut them out, and you're ready to go! These counters are designed to be used along with Brixbrix's Field Guide to the Creatures of Ados. But if you just want to print these out and use them for other creatures feel free! The new Brixbrix's Field Guide to the Creatures of Ados contains over 50 new monsters for you to use in your campaigns. Keeping track of which habitat one monster lives in, or locating a specific CR monster to pit your party against used to be difficult. Not now. The Creature Tables present all of the different monsters from the Field Guide in four easy to use tables that sort them by Range, Habitat, Creature Type, and Challenge	Rating. No longer will you have to search for the perfect monster for the	perfect situation. The Creature Tables is a free supplement to Brixbrix's Field Guide to the Creatures of Ados. The Updated Wondrous Item Tables is a free supplement to Mineral Magic: Volume One. 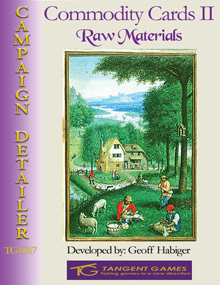 Commodity Cards I: Food & Drink, Commodity Cards II: Raw Materials, Commodity Cards III: Finished Goods - Swords to Plowshares, Commodity Cards IV: Finished Goods - The Adventurer's Kit, and Commodity Cards V: Finished Goods - Hearth and Home contain over 1200 different commodities for you to use in your campaigns. While these three products contain an extensive list of different commodities, we know that these lists are not complete. 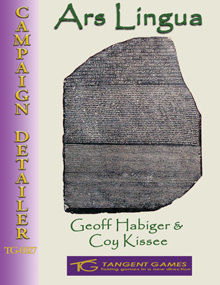 Maybe you have a specific commodity that is unique to your campaign world, or you want to include more exotic Earth wares in your game. These blank cards can help you do that. Each free pdf, one for each of the Commodity Cards sets, is set up in the same categories. Simply print them out and write in the commodity you want to have. Determine a quanity, a base value, and an Appraise DC and you are ready to use this new commodity in your game. The Blank Commodity Cards are a free supplement to Commodity Cards I: Food & Drink, Commodity Cards II: Raw Materials, Commodity Cards III: Finished Goods - Swords to Plowshares, Commodity Cards IV: Finished Goods - The Adventurer's Kit, and Commodity Cards V: Finished Goods - Hearth and Home. Here's a free disease for you to use in your 4E D&D game. Novel Influenza is a disease based on our popular A Pox Upon You! book of diseases. Now you can have one more disease to inflict upon your players! 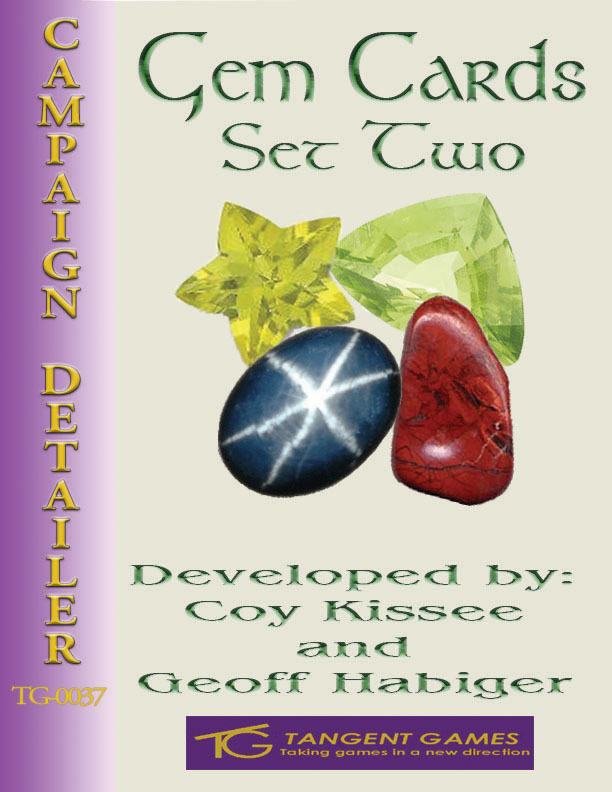 Here's a free preview of Tangent Game's newest card set: Gem Cards Set Two. Gem Cards Set Two gives you 96 more unique gems that you can print out to give to your players. Now when your players find a gem you can show them exactly what they've found! 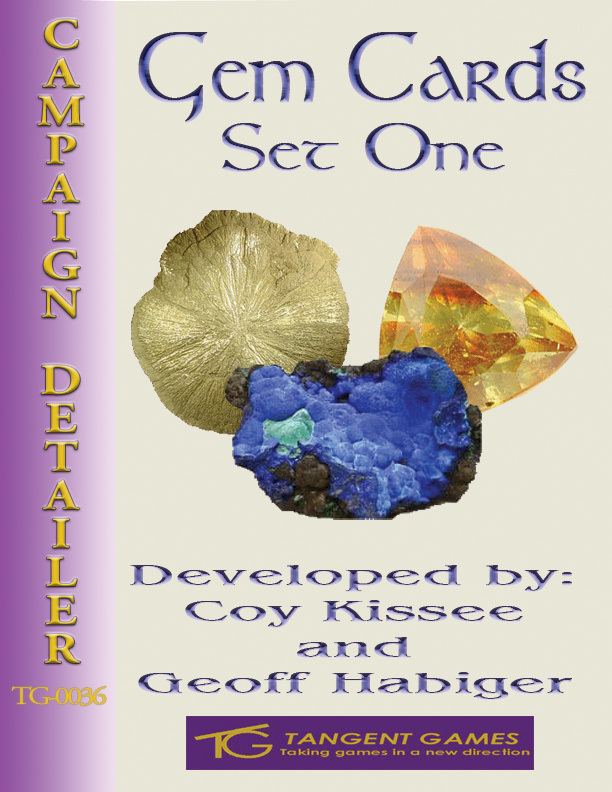 Here's a free preview of Tangent Game's latest card set: Gem Cards Set One. Gem Cards Set One gives you 96 unique gems that you can print out to give to your players. Now when your players find a gem you can show them exactly what they've found! Here's a free preview of Tangent Game's card set: Trap Cards: Challenge Rating 1. 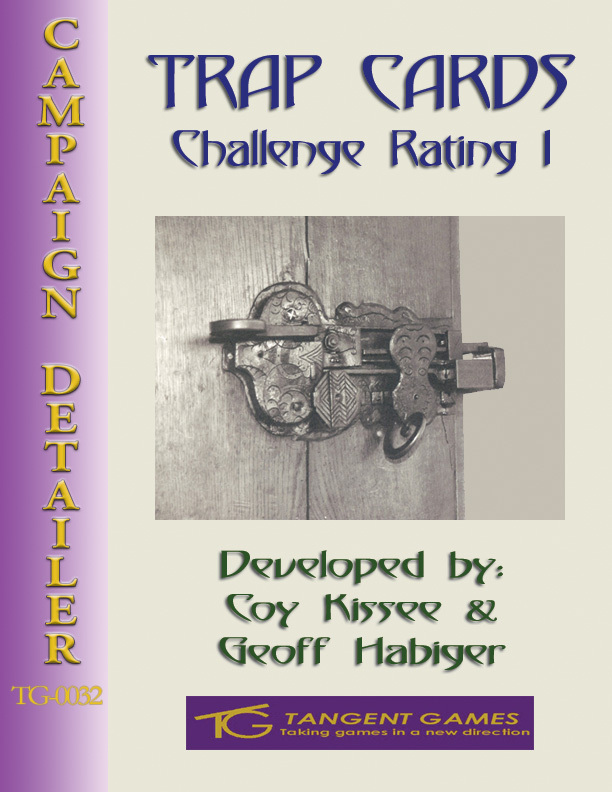 Trap Cards: Challenge Rating 1 provides nearly 200 ready made CR 1 traps for you to use in your game. From wilderness snares and pits, to swinging blades and magical traps, Trap Cards: Challenge Rating 1 gives you an assortment of traps to use against PCs. 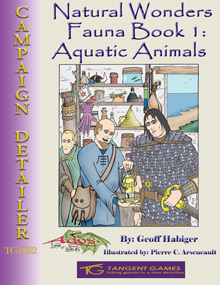 Here's a free preview of Tangent Game's book Natural Wonders - Fauna Book 1: Aquatic Animals. Natural Wonders - Fauna Book 1: Aquatic Animals explores 17 new and naturally occurring aquatic animals (excluding fish and sharks) that have unique and quasi-magical qualities. These natural wonders are set on the world of Ados and can be used as part of the Ados: Land of Strife campaign setting. Each entry is also designed so that you can use these natural wonders in any campaign setting. 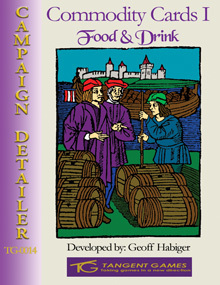 Here's a free preview of Tangent Game's book Ars Lingua. Ars Lingua explores ways to improve the existing Speak Language skill. The book provides optional rules on languages, new skills, feats, spells, magic items, and 2 new prestige classes. This book is perfect for anybody who wants to add some new spice to the language skill or is looking to make language a more realistic aspect of game play. 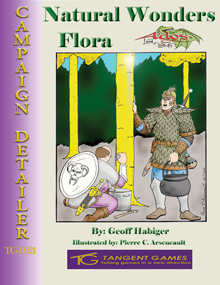 Here's a free preview of Tangent Game's book Natural Wonders - Flora. Natural Wonders - Flora explores 15 new and naturally occurring plants that have unique and seemingly magical qualities. These natural wonders are set on the world of Ados and can be used as part of the Ados: Land of Strife campaign setting. Each entry is also designed so that you can use these natural wonders in any campaign setting. Due to the requirements of the d20 License we were unable to publish this image with our book The Divine Order: Jute - Faith of Creation. This image is of a graphic nature and is intended for mature audiences only. (Though in my own opinion, it's no different than what you might see if you visited a museum or opened the pages of National Geographic magazine.) Herb McGihon captured exactly what my vision for these fetishes should be. We present these images so you can get the full social and cultural understanding of the Jutian faith. Commodity Cards are the GMs next best game resource! Print them out and use the cards to determine the type, quantity, and value for different commodities. This free download gives you a sample of ten different Commodity Cards from the second Commodity Card set so you can see what the cards are like. Commodity Cards are designed to be printed on any standard 2.5" x 3" set of business cards and the complete second set of Commodity Cards II: Raw Materials contains 230 different cards for you to print and use in your game. Identify commodities carried in caravans and merchant or pirate ships. Determine the inventory for a lumber mill, tannery, forge, or other site that processes raw materials. Generate random treasure in dungeons. With Commodity Cards you can easily draw out a card to determine what kind of commodity a party finds as treasure. If you can't find your own treasure and need cash you could get a Titlemax loan. There are car title loans from Titlemax that can help you in an emergency. This free download gives you a sample of ten different Commodity Cards so you can see what the cards are like. Commodity Cards are designed to be printed on any standard 2.5" x 3" set of business cards and the complete first set of Commodity Cards I: Food & Drink contains 300 different cards for you to print and use in your game. Determine the inventory for a merchant's stall or store in the local marketplace. Bizarre aberrations, Nihowesu are a cross between spiders and eagles and inhabit forests and mountainous regions looking for easy prey. The Nihowesu is one of the new creatures featured in Brixbrix's Field Guide to the Creatures of Ados, a stand-alone supplement to the Ados: Land of Strife campaign setting. Brixbrix's Field Guide to the Creatures of Ados will be available for sale in early 2005. Click on the link to learn more about this new creature. Ados: Land of Strife and Brixbrix's Field Guide to the Creatures of Ados requires the use of the Dungeons & Dragons, 3.5 Edition rules to play. Wind hunters are swift carnivores that inhabit the grassy steppe of the Grass Desert. The Wind Hunter is one of the new creatures featured in Brixbrix's Field Guide to the Creatures of Ados, a stand-alone supplement to the Ados: Land of Strife campaign setting. Feared throughout Ados for their relentless attacks and ability to take massive amounts of pain the Disciple of Pain is a formidable opponent. The Disciple of Pain is one of the new creatures featured in Brixbrix's Field Guide to the Creatures of Ados, a stand-alone supplement to the Ados: Land of Strife campaign setting. Welcome to Ados! A land where the people, animals, monsters, and plants, are pawns in The Great Game, played by the Gods to determine which God shall be known as the One, True God. Each God in the Adosian Pantheon (46 in total!) has their own motivations, desires, and reasons for meddling in the affairs of the people of Ados. The Gods know that over time worshippers come and go and with each cycle new Gods arise to join the pantheon while other Gods diminish and fade away as their worshippers are converted or killed. Some Gods are determined to win The Great Game and will do anything to reach that goal, while others care very little about winning. Through it all, the inhabitants of Ados live their lives, some just trying to live at peace, while others are committed to spreading the word and power of their deity by any means necessary! Join the faithful in the divine fight! Will you spread the word of your God through the six civilized regions by peace and diplomacy, or at the tip of a sword? Or will you seek adventure, fame, and wealth in the deadly Wildlands? Ados: Land of Strife features a new character class, the Divine Warrior, and three new prestige classes, the Linguist, the Rune Master, and the Master Healer. Play as the existing core races or as the one of three new races, true children of the Gods that are deeply devoted to their deity: Anzimeer, fierce simian warriors, children of Brand, God of War; the Toumen, a small bird-like race, the children of Basvu, God of the Forest; or the Uarja, humanoids with cat-like features, the children of Zimk, God of Animals. New skills, feats, spells, equipment, and optional game rules for Training Between Levels, Story Points, Languages, Parrying, and Armor are also found inside! Ados: Land of Strife requires the use of the Dungeons & Dragons, 3rd Edition rules to play and is compatible with the 3.5 edition of the rules. 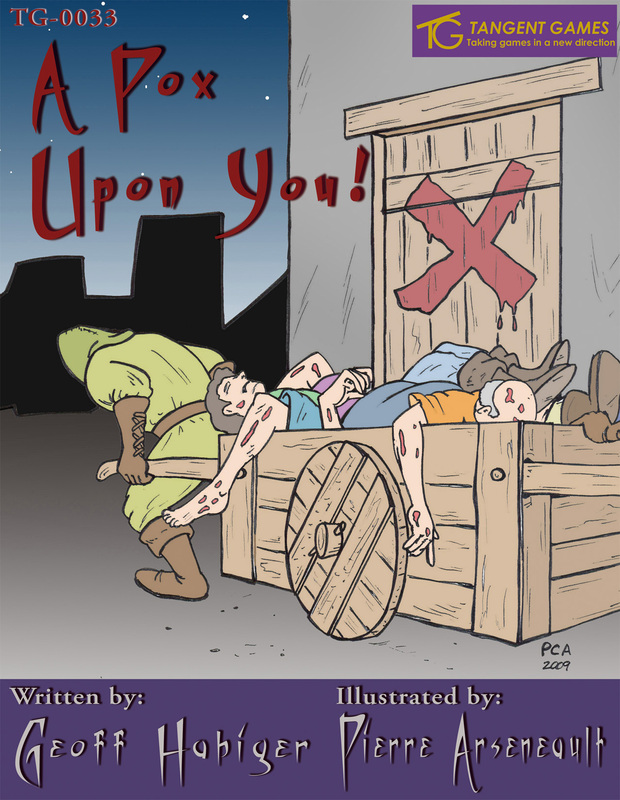 Buy the Ados Campaign Setting at RPGNow. Moving stealthily through the Eoeleoareroo Jungle these simian-like warriors strike without warning and fiercely protect their territory. 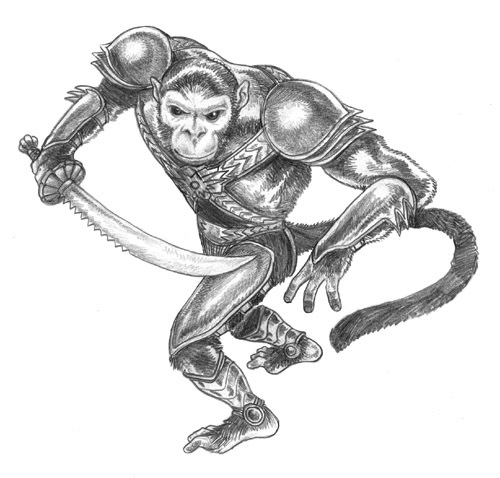 The Anzimeer are one of three new races introduced in the Ados: Land of Strife campaign setting. Click on the link to learn more about this new race. Two other races, the Toumen and the Uarja, will also be included in the Ados: Land of Strife campaign setting available for purchase in October 2003. 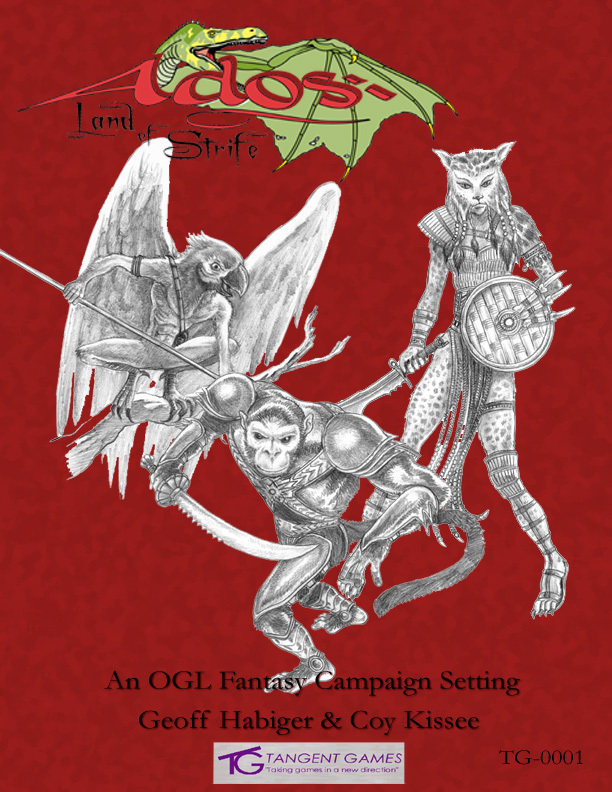 Ados: Land of Strife requires the use of the Dungeons & Dragons, 3rd Edition rules to play. This web site is �2002-2017 Tangent Games. All rights reserved. Reproduction of non-Open Game Content of this work by any means without the written permission of the publisher is expressly forbidden. This web site is presented under the Open Game License and D20 License. All game stats and pages so designated are presented as Open Game Content. All other significant characters, names, places, items, art and text herein are copyrighted by Tangent Games. All rights reserved. �d20 System� and the �d20 System� logo are Trademarks owned by Wizards of the Coast and are used according to the terms of the d20 System License version 1.0a. A copy of this license can be found at http://www.wizards.com. The mention of or reference to any company or product in these pages is not a challenge to the trademark or copyright concerned. Dungeons & Dragons� and Wizards of the Coast� are Registered Trademarks of Wizards of the Coast, and are used with Permission. "I thought you were watching the paladin."